In the midst of a brutal road trip for the Kansas City Royals, tempers flared and a rivalry was renewed over the weekend in Toronto where the Royals and Blue Jays duked it out over a 4-game series. 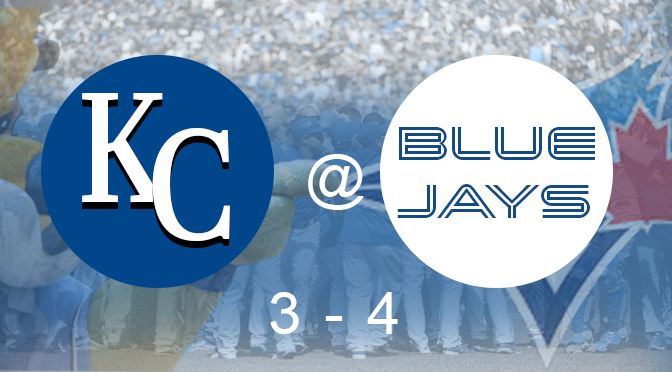 Unfortunately for KC, the Jays took 3 of 4 in the series and put on a hitting display that has some wondering whether they are primed for a run at the playoffs and beyond. With both teams having made big moves prior to the trade deadline–Royals adding Ben Zobrist and Johnny Cueto, while the Blue Jays added Troy Tulowitzki and David Price–the series turned out to be a potential preview of two of the best teams in the American League. While the Blue Jays’ overall record isn’t overly impressive, their hitting certainly was, shredding Royals pitchers for seemingly endless home runs. Meanwhile, Kansas City, for the most part, struggled to put up consistent hitting. Newly acquired Ben Zobrist was a bright spot, however, hitting three home runs in the final two games, the first two coming in Saturday’s come-back win from four runs down, and unlikely scenario if not for Zobrist’s hitting display. Cueto made his first start for the Royals on Friday night and was impressive, but a late-game meltdown and blown save by the bullpen resulted in a no-decision for the former Reds pitcher. During Friday’s game, Cueto was upset at Blue Jays star Josh Donaldson, who he claimed was stealing signs at second base and relaying them back to current batters. The spat continued into the weekend, particularly Sunday where three batters were hit and a total of three ejections took place to go along with a shoving match when both dugouts spilled on to the field. Ned Yost said it’s just baseball and none of the Royals pitchers pegged Blue Jays on purpose, but the other side of the story will likely sound different. Needless to say, a rivalry between two young and talented teams looking to make noise in the postseason has been renewed, dating back to the 1985 American League Championship Series where the Royals came back from a 3-1 series deficit, eventually going on to beat St. Louis in the World Series. Next up for Kansas City is a road trip to Detroit on Tuesday following a Monday off-day. The Tigers have seemingly mailed in their season, trading away multiple important pieces from a talented roster. Still the Tigers have live bats and score runs in a hurry and won’t roll over for Kansas City. In terms of the division race, KC still holds a strong 8-game lead over the Minnesota Twins, and a series win over the Tigers would only strengthen their hold on the division race heading into stretch run of the season. For tickets to all games home and away, visit Tickets For Less to find the best seats at the best prices for all Royals games. Your home-town team is back in action at Kauffman Stadium, Friday August 7 to take on the Chicago White Sox.